During SharePoint 2013 migration, we ran Test-SPContentDatabase cmdlet and the output report contains several MissingAssembly errors! Message : Assembly [DealEventEventhandler, Version=1.2.6.0, Culture=neutral, PublicKeyToken=b4122bae67581526] is referenced in the database [wss_content], but is not installed on the current farm. Please install any feature/solution which contains this assembly. 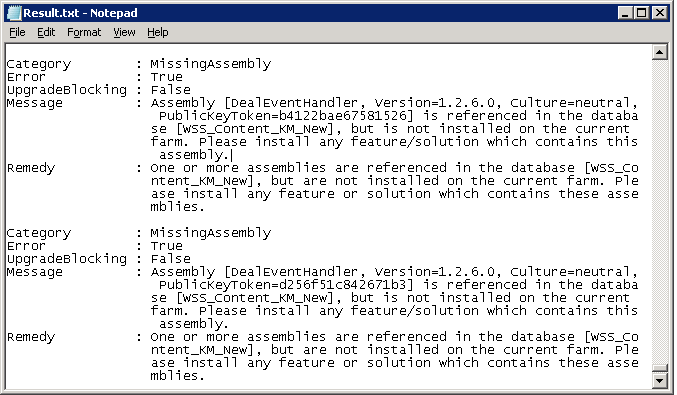 Remedy : One or more assemblies are referenced in the database [wss_content], but are not installed on the current farm. Please install any feature or solution which contains these assemblies. Usually the MissingAssembly errors arises on event receiver which are not installed & deployed to the farm and still referenced in the SharePoint list or libraries! Solution: Install the missing feature/solution which contains the missing assembly to your SharePoint Farm! Simple, Huh? but wait, You may not be always in a position to do this. You may proceed find and removing the missing assemblies from SharePoint at times. Lets use PowerShell to find all places where a particular assembly is being used and remove it. The assembly could be as part of SharePoint event receivers. Set the configuration parameters in the script from Test-SPContentDatabase results. $Query = "SELECT distinct Id, SiteId, WebId, HostId, HostType from EventReceivers where Assembly = '"+$AssemblyInfo+"'"
This script finds all locations where the particular assembly is referenced. Un-comment the EventReceiver.delete() line to delete the event receiver. Excellent. This helped me very much. Thanks.